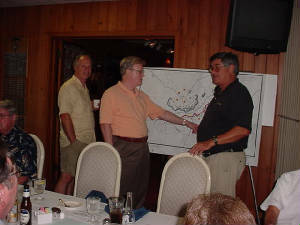 More pictures of the Outer Banks Civil War Roundtable. 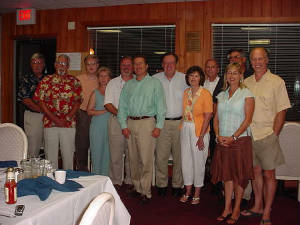 Members of the OBX Roundtable attending our July 19 2005 meeting. David Neal, Roy Archbell and Andy Watson in front of the Map of the "Mule Shoe". Roy's blowup of the Map of The Battle of Spotsylvania was very helpful in understanding that bloody encounter. Here Andy and David are asking Roy some questions about the map a while before Roy started his talk. 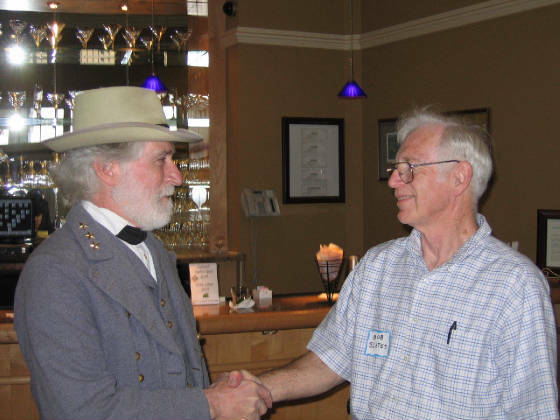 Roy is in the process of writing a book about an ancestor of his who served with the Fourth NC. What a great job Roy did. Thank you Roy! 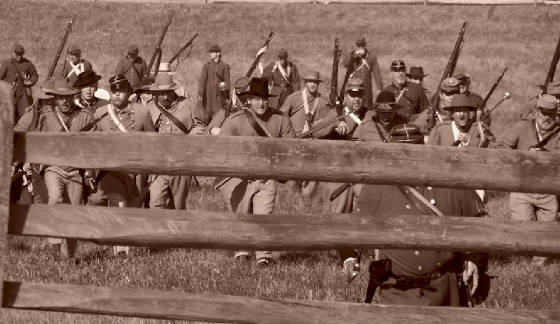 The 26th NC forming up in Bloody Lane. More pictures on the way. 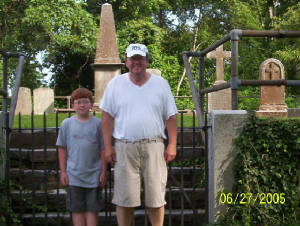 Member Michael May and his grandson in front of the Pettigrew Family Graveyard in Creswell NC. James Johnston Pettigrew is a well respected General to North Carolinians. He was wounded on the ill fated third day of the Battle of Gettysburg during the Pickett-Pettigrew Charge. He was killed a few days later during a cavalry attack on the long march back to Va.
Our third meeting August 16th. Nineteen in attendance. 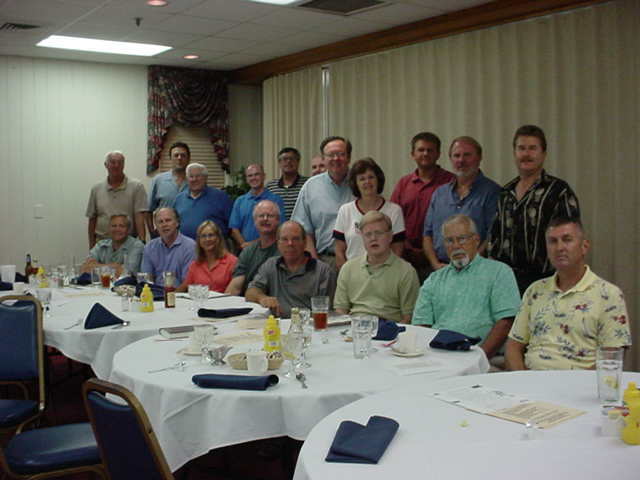 Seated from left to right are Rick Grey, David and BJ Neal, Jim Archbell, Briggs Neal, Roy Archbell, Jim Gradeless and Clyde Joyner. Standing from left to right are Alex Leary, Worth Williams, Andy Cagiano, Robert Sledge, Andy Watson, peeking over is John Sledge, Michael and Phyllis May, Ralph Ivey, Keith Sawyer and Mike Ross. Gettsyburg 1863? 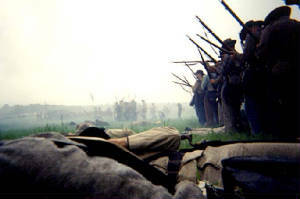 No Gettysburg 2005. Two members of the OBX Round Table are with the 26th NC reenactors at the exact place where the 26th NC came across the mile wide field during the Pickett-Pettigrew charge of July 3. Here we are charging up to the last fence before the final approach to the "stone wall". If you look closely the person on the far right is Keith Sawyer and beside him giving a Rebel Yell is Mike Ross. 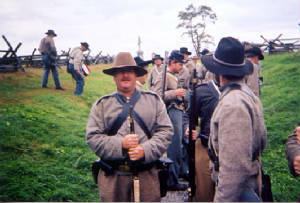 90 members of the 26th NC did a living history for the National Park Service this past October. To see more pictures of this weekend try this link. Pictured from left to right, Lance and Chris and their father Ralph Ivey, Rick Gray and Mike Ross man the booth at the Roanoke Island Festival Park Civil War Days. 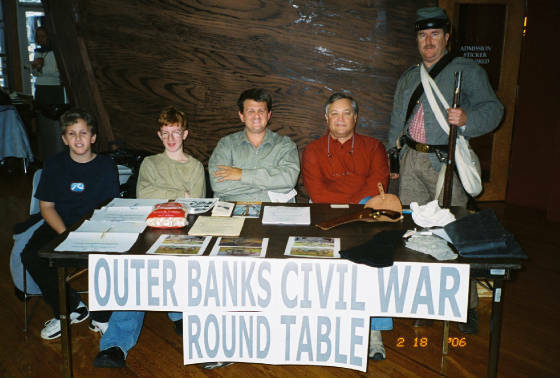 Round Table and 26th NC members recently assisted the Roanoke Island Festival Park with their Civil War Weekend on Feb. 18-19 2006. We had 9 members that manned a OBCWRT booth over the weekend to tell people about the RT and answer questions about the articles at our booth and about the WBTS in general. We also had uniformed members that performed firing demonstrations and demonstrated battle lines and drilled Park visitors. 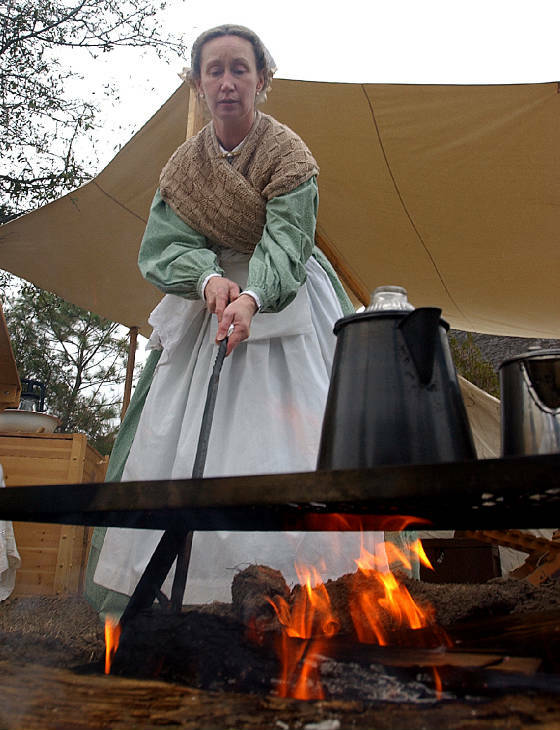 Pat and Kieth Sawyer set up a period encampment and Miss Pat demonstrated period cooking over an open fire with period cookware. By the way, this Lady can cook!!! That apple pie was fantastic. Miss Pat stoking the fire preparing to put on the biscuts. Miss Pat feeds us well. What a cook!! !